It was the same end of the field that Matt Bryant prepared to make a kick to keep the Giants’ Title hopes alive in 2002. As Lawrence Tynes lined up for the field goal to send the Giants to the Super Bowl, I had a sick feeling in the pit of my stomach. When the snap was low, it seemed to be happening all over again. 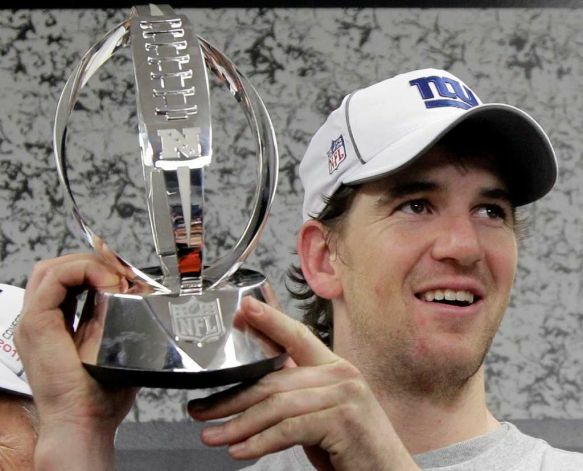 But then, Steve Weatherford was able to get the ball down, Tynes booted the ball right down the pipes, and the Giants had exorcised the demons and were heading to Indianapolis. Looking back, it was a great game. Old-school defensive struggles are the best. I said earlier that one of the keys of the game would be to hold onto the ball. The Giants did. The 49ers did not. I’m not going to pretend that the Giants didn’t luck out, but then again I’d rather be lucky than good. Kyle Williams has to get away from the ball when it’s bouncing on the ground. That was a horrible play. It shouldn’t have happened. The 49ers had all the momentum at that point, but the Giants cashed in when it mattered. If that second fumble doesn’t happen, I’m not so sure the game doesn’t go into double overtime the way both defenses were playing. Those are the breaks. There were a lot of heroes, which is how Championship teams play. Eli took a complete pounding. It looked like he was hit by a bus driven by an elephant. He deserves all the credit in the world for standing in there and making smart decisions. Sure, the Niners botched a couple of potential interceptions and fumbled once but he was being hit HARD. Victor Cruz was spectacular also. He made so many great catches in big spots. Him and Nicks are going to kill teams no matter what. Then there’s Mario Manningham who only had one catch but it was spectacular and redemption for when he dropped the game-tying touchdown the last time in San Fran. Devin Thomas recognizing that first fumble and picking up the ball was huge, not to mention his second fumble recovery. Jacquian Williams forcing that second fumble was a great hustle play. Finally, Steve Weatherford getting that snap down may have been the biggest play of the game. And so Weatherford did get the ball down and the Patriots are next. Some people might say that history is repeating itself. The Giants have gone through an NFC South team, then the #1 seed, then an underrated yet dangerous #2 seed, and now the Pats. They won the NFC in overtime on the road both times. The beat the Packers both times. Heck, the games have been played at the same times. But simply believing that history is going to repeat itself isn’t enough to win the Lombardi Trophy. Lawrence Tynes proved that history can change and Trey Junkin can sleep easy.